What do you think? Promise or paper? Heh. That's kinda my thought as well. 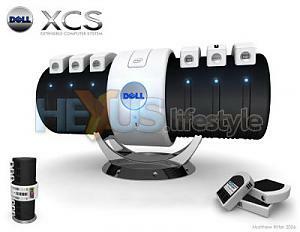 this tech is being actively developed by Freescale, IBM, NEC, Toshiba and others. this is not something that is merely a typical "pipedream", as these companies are investing large dollars into this tech. Yesterday Toshiba and NEC announced two new products; High Density FeRAM and a new RAM technology capable of reading/writing at 200MB/s. MRAM's largest hurdle since inception has always been competing with write speeds of traditional DRAM. 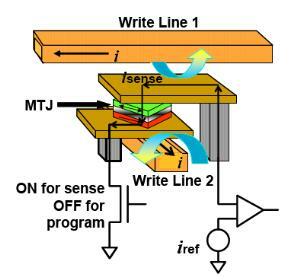 The main advantage of MRAM over traditional DRAM or SRAM is that the bits do not require electricity to hold the data state. DRAM and SRAM both require relatively amounts of electricity to "hold" the bit in place. 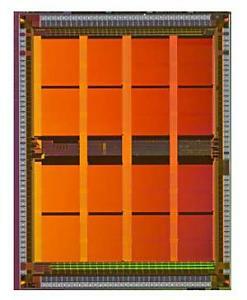 Thus MRAM runs on a fraction of the electricity the DRAM and SRAM require. On the other hand, MRAM has, until now, required a significantly larger footprint than other memory technologies. FeRAM, or Ferroelectric Random Access Memory, squeezes 64 megabits onto a single chip using 130nm interconnects -- but features the relatively slow cycle time of 60 nanoseconds. FeRAM also requires much more power than traditional MRAM, but the product may become a moderate compromise between MRAM and DRAM in the future. FeRAM kind of defeats the principle of MRAM because it uses electrical charges hold the polarity of the ferrous plates, rather than magnetic fields. The lower density MRAM also announced yesterday also features 130nm interconnects with 240nm memory "cells." Since this is true MRAM, the memory only requires 1.8V for read / writes. Unfortunately, since the process is much bigger, the density for this MRAM is only 16 megabits per chip. Some pictures as well...please be aware that freescale is simply the first company with production. Last edited by cadaveca; 10th July, 2006 at 07:46 PM. 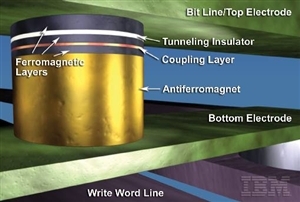 LONDON — Silicon Magnetic Systems, a subsidiary of Cypress Semiconductor Corp. (San Jose, Calif.), has shipped so-called "alpha" samples of a 256-kbit magnetic random access memory (MRAM) device to customers, and in at least two cases the memory is up and running in systems. IBM Corp. and Infineon Technologies AG Thursday announced plans to jointly develop a radically new Magnetic Random Access Memory (MRAM) technology for the next generation of handheld Internet-access devices. The companies claimed MRAM could replace flash memory as a non-volatile memory to significantly increase battery life of portable computing devices and lead to "instant-on" computers. I am perfectly well aware that FreeScale is the first one with production. My point is that this has been a LONG time in coming and is still WELL behind the curve of what can be achieved with other less costly technologies. I guess what I'm saying is that I just don't get the hype. It kinda reminds me of Automated Speech Recognition (ASR), which is a fairly big deal in my industry right now. It's a really cool technology that costs lots of money to implement, has been under development for seemingly ever, and at the end of the day doesn't really solve any problems that we can't already solve more cheaply and effectively other ways. Oh yah. Don't forget that, technically, core memory was MRAM also. It fell out of favor because it couldn't be manufactured at the densities that were rapidly becoming a requirement for computing, IIRC. Wonder if the same thing will happen here? replacement of flash, maybe? i tihnk if they can hit the 90nm node properly, it just might work. MRAM is going to have to get a LOT cheaper, IMHO, before it will be a reasonable alternative to Flash. The current price is $25 for a 4 Mib chip. That's $50/MiB! Even assuming that a migration to 90 nM from the current 180 nM process decreases their costs by a factor of 4 (which it won't) you are still looking at $12.50/MiB. Assuming that improvements in manufacturing processes yeild another 4-fold reduction in cost, you are still looking at about $3/MiB. Flash costs about 2 CENTS/MiB. Assuming, for the sake of argument, that Flash manufacturers are just totally insane and selling memory for a 1/4 of what it costs to make, that still means that MRAM WILL cost 25 TIMES what Flash costs NOW! And that assumes no further improvements in Flash technology in the equivalent time-span. To get better than that, you have to assume that the current MRAM manufacturing process has some truly abyssmal yields, something in the realm of 5% or so. I just can't bring myself to believe that. Outside of very niche applications, I'm afraid I really can't see this going anywhere within the next decade or so, if ever. Which really is a shame, because it DOES have some very nice features. The one possible bright spot in all of this that I can see is that the memory cell used in Flash technology is pretty large AIUI, and this could result in some significant scaling problems as they push to 45 nM and below. If the FreeScale (or other) MRAM technology proves to not have as many scaling issues at the smaller process sizes, that might make a difference. I was more focused on the notion that Vista might need flash, etc for some of it's advanced features. If this MRAM can replace flash for this tech, given it's cost, it might be feasible to add $15-$25 to the cost of a harddrive for a highspeed buffer. As cost-sensitive as the market for storage is, I'm not sure that much additional cost would really fly, would it? Especially as, from what I understand of the tests that have been done, it wouldn't really drop the boot speeds THAT much for the average system? what if the OS was stored on it? Last edited by cadaveca; 10th July, 2006 at 10:13 PM. Meh. You think that MRAM could replace a CD or DVD? I don't think so. Even standard RAM can't do that on the basis of cost, and it is FAR cheaper than MRAM. No, not replace a dvd/cd fully, but it might just make illegal copying of your OS a fair bit harder. Same volatility as flash, but faster...can't see anything wrong with that. Sell the OS on a thumb-drive. If you want to do that, just use masked ROMs: cheaper to make than MRAM, just as fast, and you can't write to them. So then we return to the days of the cartridge, ala Atari and Commodore? Why not? with drive density getting higher and higher, why not? Actually, I always thought the cartidge was a darned good approach to the problem: durable and fast. It wasn't until software got too big to fit on cartridges cheaply that we had to put up with this CD and DVD stuff. And the sad part is that most of what any given applications does could probably be done in 1/10 the space currently required if the industry had any real incentive to do so. But that is another topic. personally this seams a bit like OLED's to me. Well see it popping up in a few places but it will probly not go maintream for many many years. And the sad part is that most of what any given applications does could probably be done in 1/10 the space currently required if the industry had any real incentive to do so. But that is another topic. Stick linux w. basic browser and browser functionality, and sell it ona thumbdrive. If done right, you can have your OS on one rom and user storage on another. plug into any pc for a secure browser environment. Match it up with those pc-in-a-socket, and you got user-customized workstations. Last edited by cadaveca; 11th July, 2006 at 01:40 AM. A computer with an OS, with browser and other limited functionality stored in ROM? Rather like all the thin client solutions then?